A student TV studio has been opened at the Laboratory of Creative Technologies at Vilnius Gediminas Technical University’s (VGTU) Faculty of Creative Industries. It is a unique initiative in Lithuania providing an opportunity to students to put themselves in the shoes of a producer, script writer, director, cinematographer, film editor, or even an actor. According to Aistė Ptakauskė, the Head of the Laboratory of Creative Technologies and the initiator of this project, the television in Lithuania often faces fierce criticism because “it doesn’t meet the international standards”. We must be honest, the current Lithuanian TV formats cannot compete internationally. Such situation in the TV industry in Lithuania, as A. Ptakauskė explains, is due to the lack of a consistent education of TV professionals: there is not a single study programme on the university level dedicated to the television art and business. Thus, VGTU will try to fill this gap, at least to some extent. “The young creators are welcome to implement the boldest and the most innovative ideas. They will receive assistance from experienced local and international TV professionals. 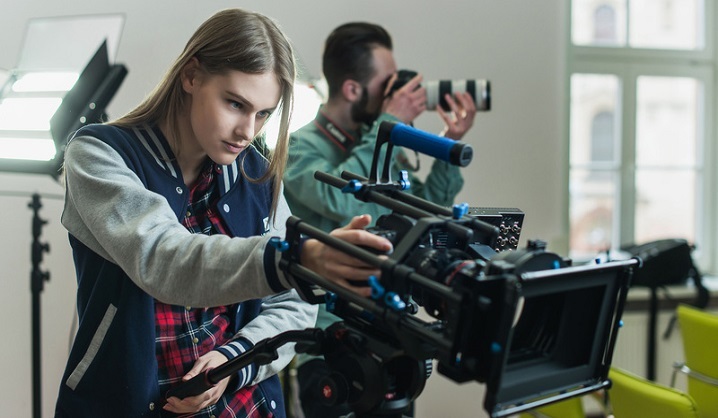 Students who will join VGTU TV studio will learn the basics of production, directing, script writing, filming, and editing; they will have a possibility to build a portfolio that will demonstrate their creativity, knowledge, and skills, and will give them a competitive advantage in the job market. We hope to facilitate the birth of the bravest, most interesting and progressive TV films and dramas that reflect ambitions, worldview, and creative potential of the young generation of content creators,” says A. Ptakauskė, the initiator of VGTU student television. Students do no need any specific knowledge or skills to take part in the activities of the studio. The team of the Laboratory of Creative Technologies is there to help everyone to learn the necessary skills. Furthermore, students will have an opportunity to develop their TV projects under the mentorship of experienced local and international media professionals. The ones who do not have a project idea yet will be able to join the teams and projects of other students. If you are interested in the world of the television industry, fill this form by 1 December and join us.